Here’s Iraq’s new flag. It was approved by the Iraq Interim Governing Council on April 26th. The most striking features of the flag are its colours and its crescent. The crescent obviously represents Islam, but I don’t understand the blue colour. The two blue bands at the bottom are said to represent the Tigris and Euphrates rivers, so the overall blue colour may represent water and thus life as the Iraqi region is often labeled the ‘cradle of civilization’. However, many Iraqi’s are complaining that the blue and white flag looks like the Israeli flag and less like the flags of its Arab neighbours. The white colour, as it does in the flags of many other countries, may represent peace. Martin to drop the writ on May 9th? The latest rumours and indications do show that the Liberal party is gearing-up for a late-spring election. I believe that the writ will be dropped on May 9th as Paul Martin returns for a week of extensive coverage after his visit with US President George W Bush this Wednesday (update: actually this Friday). Canadians have placed Canadian-American relations high on the concerns list and whatever Mr. Martin accomplishes in Washington (not Crawford) will be translated into an instant boost into the polls. Two international also take place in the 36 days between May 9th and an election on June 14th. Paul Martin will visit Normandy (not Norway) on June 6th and the G8 summit in Georgia from June 8th through June 10th. These two events should keep Mr. Martin in the news for international (look I’m doing my job) type of events. So, Mr. Martin, in his short time in office, has/will become the Prime Minister visible on the international scene while he will be seen as dismal on domestic policies. Let’s just remember why Canadian-American relations are at a recent all-time low, remember why Canadians were able to liberate France 60 years ago, and contemplate whether the Liberals are setting, or being led by, the trend of globalization. Posted on April 25, 2004 Author Stephen TaylorCategories OtherLeave a comment on Martin to drop the writ on May 9th? The Conservative Party of Canada released television ads yesterday. 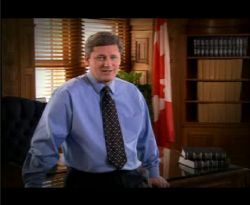 The spots feature a casual-looking Stephen Harper leaning against his desk. Harper mentions that it’s time for accountability in Ottawa and doesn’t mention the sponsorship scandal directly. The ads run will run after the liberal party advertising campaign, which occurred a few weeks ago and featured an adlib Martin talking about how there needs to be accountability in Ottawa. Accountability is a good concept, however, I’ll vote for the party that takes it on as a policy issue and not as an afterthought. Svend Robinson will step down from his parliamentary duties and take a leave of absence. Today in a press conference, the NDP member from Barnaby-Douglas told the media that the reason was due to a lapse in judgement. He “pocketed a piece of expensive jewelry” and blamed the incident on “severe stress and emotional pain”. Mr. Robinson is a senior parliamentarian from British Colombia as he was originally elected to the House of Commons in 1979. He has been re-elected seven times since. While it was an extremely childish and foolish thing for Mr. Robinson to do, I find it upsetting to see a career potentially end in such a way. This is not so much a political failure for the NDP as it is a personal failure for Robinson. I do not subscribe to the principles of the New Democratic Party of Canada and I would not be saddened to see their influence in the House of Commons make way for the votes of the Conservative Party of Canada. However, Mr. Robinson’s seat is still an NDP seat and thus an NDP vote. The personal destruction of Svend Robinson does not benefit the political agenda of any party; his seat may just be filled by another NDP nominee in the next election. Some may laud this turn of events as a win in the us vs. them realm of partisan politics. Let’s not celebrate the demise of a man’s career. We can criticize a parliamentarian’s personality if it seems to reflect party policy (such as Mr. Robinson’s ill conceived trip to meet with Yassir Arafat), however, the personal misjudgement of Svend Robinson does not reflect his party and therefore I would find it petty to dance on the grave of a man’s career. Paul Martin woke up to a headache this morning when he learned that his Liberal party had sunk back to its previous low of 35% in the polls. The “mad as hell” campaign didn’t seem to work as the Prime Minister is only now truly learning of the anger and uncertainty that Canadians have in the Liberal government. These results also follow the recent Liberal advertising campaign showing an ‘adlib’ Paul Martin expressing that his mandate will be to get the bottom of his own party’s corruption. A spring election call would be an absurd strategy for Mr. Martin at this point. Our unreformed political system allows Paul Martin to call an election at his whim, whenever the polls are good. I don’t know how they can get better for the Liberals. The Conservative Party of Canada is steadily rising as they sit at 28%. The “Jack Attack” seems to be having some effect as the NDP is gaining in British Columbia as the NDP sit at a nationwide 18%. The Bloc Quebecois is holding at 10%. The poll also found that only 17% of Canadians have a favourable impression of the Liberal Party. Another interesting measure showed that Paul Martin has a 41% favourable impression compared to a 40% unfavorable impression (19% undecided). Stephen Harper, on the other hand, has a 32%/23% favourable/unfavourable split (44% undecided). These figures should be encouraging to Mr. Harper as an election campaign will do well to (re)introduce himself to all Canadians as the new leader of the new Conservative Party of Canada. The Conservative Party of Canada should be encouraged by these results as Canadians are seeking to replace the governing Liberal Party. However, the Conservatives should realize that an incredible opportunity for growth exists in Quebec. While separatist sentiments are now low in that province, the Bloc now leads the Liberals in a 45%-30% split. The Conservatives are making gains in Quebec albeit slight (11%). Quebec is moving their support to the Bloc as no other option really exists. For a significant part, Quebec is using the Bloc as a placeholder to vote against the Liberals. Indeed, Quebec voters do not expect the Bloc to form the next government; however, they do know who don’t want to govern. Thus, the Conservative party should invest many efforts in Quebec because that province is in need of a viable option. The Conservatives probably won’t make serious gains in Quebec this time around, but Quebec should be a serious focus of the Conservative Party in the future. Marc Lefrancois, the former president of VIA Rail is set to testify before the Public Accounts Sponsorship Committee today. Let’s review just one of the reasons why Mr. Lefrancois is a key witness to the misappropriation of funds by the Liberal government’s Ministry of Public Works. The Ministry of Public Works agreed to sponsor a television hockey series about Maurice “the Rocket” Richard produced by the company L’information essentielle. For some reason, the ministry told L’information essentielle to contact VIA Rail and Canada Post for the money to produce the series. Now, initially VIA Rail denied L’information essentielle the money to produce the series, but Public Works essentially asked VIA for a loan and got this crown corporation to pick up the tab on the promise of reimbursement once Public Works received its funding from Parliament. The bill came to $910,000 for VIA and the company immediately recorded it as a debt to be repaid by the Government of Canada. I don’t know why a company would take on such a debt when they operated at a loss of $220 million that year — check VIA’s 1999 annual report here). Here’s where things get interesting. VIA had to get repaid for loaning the Ministry of Public Works $910,000. So, Public Works hired Lafleur Communication (yes, that Quebec advertising firm) to do some work outlined in a contract that, according to the Auditor General, “was worded in very general terms and was not clear on what Lafleur was to deliver”. Marc Lefrancois told the Auditor General that it was his understanding that VIA would only recover $750,000 from Public Works. So, it became particularly puzzling to the Auditor General to find that Lafleur Communication was to bill Public Works $750,000 plus $112,500 (15% commission). After Lafleur’s ‘work’ was done, VIA invoiced that company for $750,000 and received the cheque on the same day. 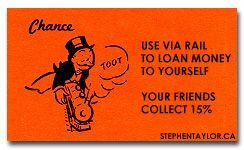 So, Lafleur Communication (yes, that Quebec advertising firm) was used as the cheque passer between Public Works (the debtor) and VIA Rail (the debtee). For their work, Lafleur Communication received $112,000 “for delivering the cheque” as Sheila Fraser put it. VIA was still owed $160,000, so they chalked it up to an “advertising expense” because they concluded that the Rocket Richard series provided them good visibility. The question remains: Why would VIA Rail, operating at a loss, be used as a conduit through which the Ministry of Public Works could borrow money to pay for a television series on Rocket Richard? Also, who’s idea was it to create a debt in one sector of the government (the crown corp) only to be later repaid by the debtor (the Ministry)? I don’t question the merits of making a television series about Rocket Richard, I question who made it possible for Lafleur Communication to make $112,500 for passing a cheque between the hands of the federal government. The latest polling numbers from Quebec indicate to Mr. Martin that a spring election would be an unwise decision. In the latest CROP poll, the Liberals are 10 points behind the Bloq as they split the province 35-45 respectively. So, what is Paul Martin’s Quebec strategy? Run some separatists as Liberals in the next election! Warren also concluded, “I’ll not be voting Liberal”. In Mr. Martin’s bid to form a majority government instead of a minority government, he is the one who is forming an alliance with the separatist bloq at the expense of the (now former) Liberal party faithful. Last week I had a discussion with a fellow Kingstonian and asked him why he doesn’t now support the Conservatives. He replied that he identifies more with the philosophy of the Liberal party. But, it seems the the Liberal philosophy is becoming muddier and muddier each day. People who are liberal know what they believe, however, it’s becoming clear that the Liberal Party is sacrificing its own philosophy in its bid to retain power. We need a competitive political environment in this country where parties stick to their principles so that when they don’t, the electore removes them. Cheering for a political party as if it were the hometown team is rather childish. At the end of the day it’s policy and principles which matter. Therefore, I applaud Mr. Kinsella for standing up for the philosophy and not for the party. This joke came to me today by email. Pass it on! The steps at the Parliament Hill building needed some repairs so bids are taken from contractors from across the country. First a contractor from Toronto looks it over. After a session of measuring and figuring he presents his bid. I can do it for $19,000, he says. I’d need $9,000 for materials, $9,000 for my crew, and $1,000 profit for me. Next a contractor from Calgary does his measuring and calculating then says, I’ll do it for $17,000. $8,000 for materials, $8,000 for my crew, and $1,000 profit for me. Last a Liberal-friendly advertising firm from Montreal steps up. Without even looking at the job site he says, I’ll do it for $57,000. Surprised at how high it is, the man taking the bids asks him to explain it. It’s simple, he says. $20,000 for me, $20,000 for you, and we hire the guy from Calgary. Now, of course, an election is only a “rumour”. However, Richard Mahoney, the Liberal candidate featured on the lawn sign above, is set to run in the Ottawa-Centre by-election on November 29th. The election date for Ottawa-Centre has been declared, so this allows us a sneak peek at the Liberal lawn signs. First Impressions? The Liberal strategists, as I’ve said before, are pushing “Team Martin”. Liberal? No! It’s Team Martin! Has “Liberal” become such a bad word in the mouths of Canadians that even the Liberals are ashamed to identify themselves as such? Will the Liberal/Team Martin candidates be running on the Liberal record or the Paul Martin record or aren’t the two one and the same? Sadly, I feel that this election is going be about the ‘cult of the leader’; It’s Paul Martin vs. the Harper-MacKay ticket vs. Jack “the shin bruiser” Layton. Personalities over policies… how sad. Paul Martin will be saying “Look at me, I’m cleaning up Ottawa”. Stephen Harper will, at least, be attacking the Liberal team for making the mess and Jack Layton will be figuring out clever and catchy ways of articulating his classic rhetoric. The Conservatives will do well to campaign as a team instead of solely as Stephen Harper. The leadership bids of Tony Clement and Belinda Stronach were able to cast a larger net over the minds of Canadians. If we push our team as the unified party, we will capture the interest of more Canadians. This strategy will stand in stark comparison to “Team Martin”, which is an ironic term in itself; if the Liberals were a team, they would be referred to as the Liberal party.